Deep Fire has spent the last ten years perfecting their aftermarket internal parts and upgrade kits and today I will be reviewing one of their latest full tune kits, an M120, standard bore kit for M4 carbines. This kit includes pretty much everything you need to safely run an M120 in your gun, provided your gears and motor will pull back a spring of that power. I will discuss the various aspects of this kit in this review! I was sent this kit to review directly by Deep Fire, which is based in Hong Kong. In the US, you can find this kit for sale at airsoft retailers such as Airsplat, who has it available HERE, priced at $109.99. You can find FTKs for pretty much any gun/spring combination that you might want to run at various retailers, especially overseas ones such as UNCompany and Redwolf Airsoft, so if you want to run a different combination than the one reviewed today, check them out. A Full Tune-up Kit "FTK" is designed to give you pretty much everything you need to upgrade your gun in one package. They can be used either as an upgrade, or as a replacement for broken internal parts. Generally, it is less expensive to purchase a FTK than to purchase each of the included parts individually. If you were to purchase all of the included parts separately, you would be paying about $150, so you basically are getting $40 off by buying the whole set. The FTK comes packaged in a plastic box with a foam inner liner that holds everything securely during shipping. The package has a label to indicate what gun model the kit is for, as well as if it is a standard or bore up kit. Included in the FTK is a titanium tooth piston, ported cylinder, tapered CNC aluminum cylinder head, ported aluminum piston head, o-ring air nozzle, tappet plate, 6mm steel bushings, ball bearing spring guide, and finally, an M120 spring. This is pretty much everything you need to increase the velocity of your M4 AEG. First off, the kit comes with a titanium full tooth piston. This piston has a full metal rack for high strength and durability. I am using it with the included M120 spring, which is plenty powerful enough to strain the teeth of the piston. I attached the included ball bearing ventilated aluminum piston head to the piston using the included hardware. I added a drop of loctite to the screw to prevent it from backing itself out during firing. Some users report that the teeth may be pulled out the back of the piston, and that reinforcing it with some JB weld can alleviate this potential problem. The cylinder has three tapered ports at the rear which are smaller than normal ports, but since there are three of them, you get the same porting as one large port. The ported design prevents you from having an excess of compressed air for use with the shorter inner barrel of an M4. If you have too much air being compressed, the BB will have left the barrel before the piston completes its cycle, which can lead to less than peak power output, due to the way a piston accelerates in the gearbox, as well as a potential loss of accuracy due to excess air behind the BB to affect it after it fires. The cylinder head is a CNC machined aluminum unit, which is anodized in a purple color. It has a deep taper as well as a rubber cushion applied to the inner surface of the cylinder head. The tapering helps smooth the airflow for optimum performance, and the rubber cushion prevents excessive amounts of impact to go into the gearbox shell, causing premature failure. The air nozzle that comes with it is made of a polymer that has a tiny o-ring installed inside to form a nearly perfect airseal with the cylinder head nozzle. Deep Fire includes a polymer tappet plate, not so much as an upgrade, but as a replacement part, as it doesn't really have anything special about it. That being said, it's nice to have a spare tappet plate included in the kit. If your gun doesn't include metal bushings, it's a good idea to replace your plastic bushings with metal units if you are going to run an M120 strength spring. Deep Fire includes a set of 6 tempered steel 6mm bushings in the FTK, so if your gun doesn't have metal bushings/bearings from the factory, you're good to go. Last but not least, Deep Fire includes a metal ball bearing spring guide, as well as an M120 spring with an irregular pitch design. The spring guide is a gold color, and the ball bearings ensure smooth operation without binding the spring while firing, as well as theoretically aiding with accuracy due to smoother acceleration of the piston during firing. I've found that Deep Fire M120 springs are slightly underpowered, more along the lines of an M110, so keep that in mind when purchasing this kit that you will likely end up with M110 power output, in the 390-400 FPS range. To test the kit, I installed it in my Deep Fire Silver Series M16, which I've previously installed a Madbull Dissipator outer barrel and 363mm Deep Fire 6.04mm tightbore barrel and standard torque Deep Fire titanium gears. Installation was relatively painless, with the exception of the tappet plate. The front of the tappet plate needed to be sanded down slightly to fit inside the reinforced gearbox shell, but once I got it shaved down a bit, it fit perfectly and moved smoothly. Once installed, I got everything lubed up with silicone lubricant, and ran it for about 250 rounds to break everything in. After breaking everything in, I threw in some Airsplat .20g BBs, and stepped up to my Madbull chrono to get some solid info. The gun was shooting about 330 FPS before I installed the FTK, and now it is shooting 401.3 FPS on average. This is lower than most M120 springs on the market, so I tossed in an Element M120 spring to see what it shot, and I got 424.9 FPS on average, showing that the kit does give great compression, but the Deep Fire M120 spring is a little bit underpowered compared to other M120 springs on the market. That being said, consistency is great, only varying +-3 or so FPS. If your AEG is lacking in performance, and didn't come from the factory with the best internal parts, than a FTK is a great option to give you increased performance at a relatively affordable price. 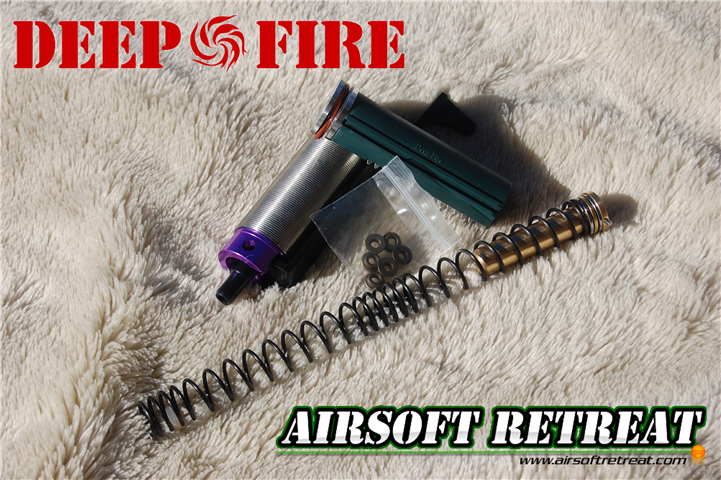 The Deep Fire FTK is a fantastic option if you are in the market for a kit, as it includes pretty much everything you may need to fill your gearbox with high end parts and get great performance. They have kits for pretty much every gun, as well as bore up kits for very high performance guns.